An independently run fine art print shop specializing in Monotype, Intaglio, Relief and Screenprint. Erin Morrison’s exhibit of her plaster reliefs is coming to an end at the Samuel Freeman Gallery this month. 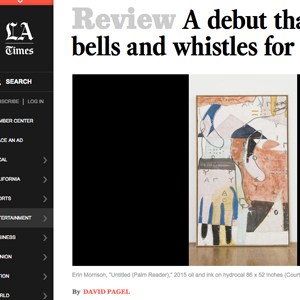 The exhibit garnered a positive review from David Pagel in the LA Times. Even if you were not able to make it to her show and see the one monotype she made with Todd you can always visit her gallery at Press Works to see her 22×30 inch monotypes she made at Press Works. They have some of the same exploratory qualities of her plaster pieces. Some subtle, others bold and colorful. Posted in: artists, Erin Morrison, exhibits.